This park has two small pretty lakes, ringed by a figure-8 of trails. There are very old trees here, good fishing, bridges, waterfalls, and a swimming area. There is great topography at "the dams", and while the trail system is smaller in circumference than Westwood Lake's, it still presents a bit of climbing, and the views are pretty. There are dramatic waterfalls at the highest and lowest points of the park. This place should not be confused with "Morden Colliery Park" to the south. 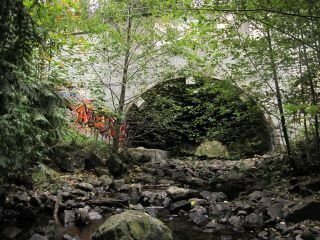 There's an interesting tunnel connected to the park, and I think some people don't know about it. It's the huge culvert which allows the Chase River underneath the Parkway. There's a wide concrete walkway above the water line, so it's comfortable to walk through. A lot of graffiti art, good and bad, is covering the wall of this tunnel. It's very interesting by day or night. You can also continue past the tunnel and see another dam, as well as a 4+ meter waterfall (which is more or less dramatic depending on the season). Go to the Colliery Dams (Harewood Dams) and find your way to the wooden pedestrian bridge at the highest point of the trail system (above the higher lake). You should be able to hear the Parkway just upstream. Walk to the southern end of the bridge (towards Ladysmith) and keep going, staying to the right. You'll see a trail that leads down to the river, and in about 90 seconds you'll find yourself facing the big culvert. Check it out!